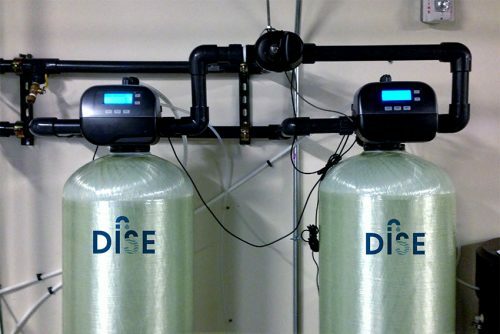 Green - INDUSTRIAL WATER CONSULTING, INC.
Our patent-pending Di-Ionic Synergy Exchanger (DISE®) uses an approach to exchange-based water treatment where cationic exchange and anionic exchange occurs in one vessel. How does our approach differ from others? Conventional exchange-based water treatment systems that use ion-based resins employ two separate vessels to perform water softening and de-alkalization processes. Because two vessels are used, separate measurements are employed to determine the effectiveness of water treatment. Additionally, each vessel is independently coupled to its own regenerant. This method requires frequent on-site testing. DISE opens the door to additional monitoring options that better protect and serve the needs of our clients. 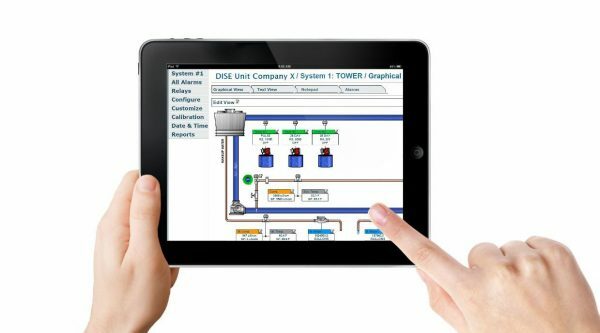 DISE controllers are remotely accessible, which permits greater control over the water treatment program. Once a baseline is acquired for any given water source, deviations from that baseline can be monitored to gauge system performance and indicate successful regenerations. DISE reduces scaling potential by exchanging scale-producing ions with more soluble ions, such as sodium and chloride ions. Better makeup water quality allows for improved corrosion control. For example, the anodic corrosion agents form a thin film of gamma iron oxides on pipe surfaces. This thin film works synergistically with the DISE water treatment process to improve corrosion resistance. The single vessel system safely elevates water pH levels by controlling alkalinity cycling, thereby taking control of biological growth. "A quick analysis of the water bills reveal a significant drop in water use since mid-2010 and a sharp increase in overall temperatures. We may attribute much of this improvement to the effort of DISE. This is a fairly remarkable story considering this drop represents about 19 million gallons of water." 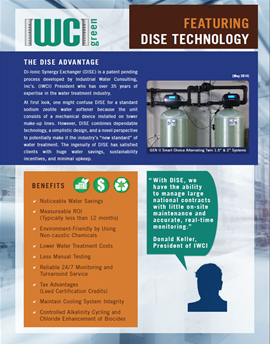 DISE creates higher water concentrations providing for near-zero blowdown approaches, which permit discharge of non-toxic water and chemicals. Using non-caustic chemicals proves to be effective in regenerating both the anionic and cationic resin. This results in a more environmentally-friendly process and reduces waste of water. Many water treatment providers increase cycles of concentration to help save water, but this method typically requires additional on-site service/testing or equipment that leaves the customer breaking even. Increasing cycles can expose a facility to accelerated damage and production delays if inadequate control measures are in place. The DISE program reduces the risks associated with increasing cycles by offering remote monitoring safeguards, improved detection, and remote diagnosis of problems. The DISE program reduces chemical use and prevents unneeded service visits. Clients normally see a 2 year return on their investment after implementation.